I first heard this music in "Moonrise Kingdom". I wanted to hear more of B. Britten's music. This is a good compilation. "The Young Person's Guide to the Orchestra" is more than an educational piece, although it does the job of introducing the instruments extremely well without or without narration. There are so many recordings of this enormously popular work that it's quite difficult drawing an opinion on which is the best, it's usually coupled with Prokofiev's "Peter and the Wolf" with most recordings going without narration. 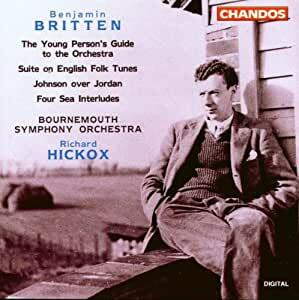 This disc in particular with Richard Hickox conducting the Bournemouth Symphony Orchestra has some benefits over others because it does a extremely good job of introducing lesser known works of Britten, Hickox has always been a good interpreter of British music and this disc is no exception. The premiere of the opera Peter Grimes was a landmark in Britten's career and 20th century British music, along side his opera Britten composed four vivid Sea Interludes which have become a concert piece in their own right. These evocative pieces paint the atmosphere of Suffolk and the region's coastal land and sea. "The Suite on English Folk Tunes" was Britten's last orchestral work and is a masterwork of scoring. The two violins in "Hunt the Squirrel" that are alone and unacompanied are literally chasing one another. The highlight being "Lord Melbourne", it's a movement of haunting, poignant beauty. "Johnson over Jordan" was an ambitious experimental play in which music, mime and dance were intregral to the drama. It's concept was influenced by the Tibetan Book of the Dead with Johnson the central figure, after he dies goes through a series of dreamlike episodies with people and incidents from his past. Unfortunately, the download has about 0.5 second silent spaces between each of the sections in Young Person's Guide. This is meant to be heard as one continuous piece. Amazon says that it was delivered to them this way. It is unbearable to listen to, IMO. The musicianship is good and well played which makes this even more disappointing.